Sometimes my work as a book reviewer has me read things I wouldn’t necessarily pick out from a bookstore shelf. 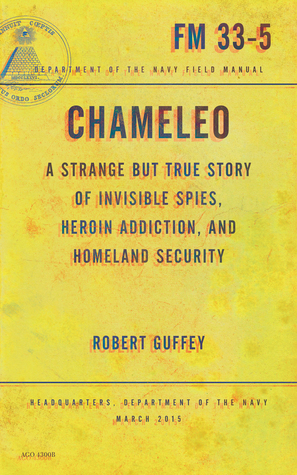 Take Chameleo: A Strange But True Story of Invisible Spies, Heroin Addiction, And Homeland Security for example. The title is curious, but it seems rather outlandish. Okay, I lied. I would totally pick this out from a bookstore shelf BECAUSE it is so outlandish. And outlandish, funny and curious you get with this book. The basic story is this: a college English teacher gets a call from a heroin-addicted friend, Dion, who complains of weird things happening to him after being arrested: men in suits following him around everywhere in town, weird noises keeping him up at night, even the impression of small invisible midgets entering his bedroom while he sleeps. The book is about Dion’s mission to escape this mental torture and to prove that he has been a victim of illegal (and rather strange) harassment from the government. Even though I had categorized this as a non-fiction book in my Goodreads, I changed my mind later and put in on a fiction shelf. Why? The main reason is that Guffey decided to begin the book with quotes from The Body Snatchers and Frankenstein. The Frankenstein quote in particular is interesting: “The story is too connected to be mistaken for a dream, and I have no motive for falsehood.” Given how unreliable Victor Frankenstein is as a narrator, I smile at the irony of putting this as an opening quote for a book that sells itself as non-fiction. In any case, the book itself wavers between funny, weird and annoying. Funny: the relationship between Guffey and Dion gives rise to some hilarious quips and observations about life in post Patriot Act America. As his two shadows continued to spy on him, Dion nonchalantly went about his business. He started making spaghetti, but as the constant sight of these two jarheads began to grate on him more and more he started adding special ingredients to the mix: shredded cheese, Worcestershire sauce, rice, flour, mustard, ketchup, cinnamon, cayenne pepper, peanut butter, Tang, Jell-O mix, sugar, honey, multicolored sprinkles, and stale almonds. He stirred it all up until it was a nice, thick, noxious goo, then ran outside, tossed the entire concoction over the fence, and hit at least one of the agents dead on. Both of them screamed and went running off towards the nearby Vons parking lot. If that’s not an effective way to get rid of spies, I don’t know what is! The book deals with strangeness in many ways: hallucinations, mostly visual but also sometimes auditory, and a glimpse of the life of someone who is (or feels that he is) under constant, oppressive surveillance. Sometimes I couldn’t help but frown at some of the outlandish claims and events reported in the book: weird science-fiction paintings replacing Dion’s view from his bedroom window, and other strange happenings. It made me constantly question Dion’s sanity (which I guess is the point) and reflect on the reality of someone who could really be under such psychological torture. Wouldn’t you go crazy too? And then there are the annoying bits, like entire transcripts of phone conversations between Dion and Guffey. I really think that they could have been summarized, with only the important quotes used. I began by trying to read them through, but after 10 pages I just kind of skipped ahead. It was a bad stylistic choice, I feel, and slowed down the progress of the story considerably, and for no apparent story-driven reason. There was just nothing in these conversations that justified the entire transcript being used. That being said, the book as a whole gave me a few good laughs and left with a strange sense of the power of our governments. It’s a good way to spend your time if you’re interested in the issue of over-use of military surveillance on civilians. You’ll laugh a bit, you might find it strange, but you’ll also close the book with a strange, “I’m kind of happy this is over but I’m glad I read it” smile on your face. If it’s so easy to imagine deploying dozens of people and spending thousands of dollars surveilling a single drug addict and small-time drug dealer, what are they capable of doing on the scale of a nation? I am not sure why you question that this is a work of non-fiction? Do you mean that you doubt that the story Dion tells is true? Or are you saying there is no Dion, and he never reported these events to Guffey at all? Because I can assure you that there is and he did. Do you mean you think it is non-fiction simply because of the Frankenstein quotation? While Dion as a narrator of his own story is of course unreliable, that is part of the point; the transcripts that interrupt the narrative serve to allow Dion to tell his own story. Did he say these things to Guffey? Yes. Did Guffey record them verbatim, yes. That he said these things is non-fiction. Or do you say it is non-fiction simply because at times it is written as a non-fiction narrative, instead of simply being expository reportage. As Guffey’s first reader, and friend to both Dion Fuller and Robert Guffey, I am curious and look forward to your reply. Thank you.